Blade Length: 78 cm, 29.5"
M.St. 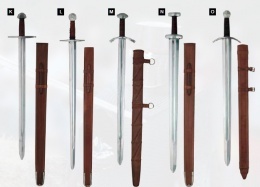 Maurice Sword 13th C- this sword in two versions, regular and fighting (light combat ready) models. Made of hand-forged EN 45 solid steel, this sword features a fullered blade and a single tang. Steel oval pommel and downward curving quillion. It includes a leather covered scabbard and metal mounting loops. Specifications are: Blade Length : 31", Blade Width. (Widest): 1.9" & Overall Length : 37.5". two versions, regular and fighting (light combat ready) models, this is the regular version. Made of hand-forged EN 45 solid steel, this sword features a fullered blade, single tang and a leather-wrapped grip. It includes a leathered scabbard. N.Hurum Sword- loosely based on classic Viking sword design, with the name from The Hurum ridge, that lies right opposite Svelvik and Sverstad, and is almost (like a sword) cutting the Drammensfjord in two parts. This page was last modified on 18 June 2014, at 17:32.